Scottie Giordano OF (Croton HS) was named NJCAA Region XV co player of the year. Giordano was also named first team All Region Pitcher and All Region outfield. Brian Corporan was named first team all Region infield. Steve Guzman was named 2nd Team All Infield and Steve Guzman was named 2nd team DH. Scottie Giordano was named Gold Glove outfield for his defense… Scott Giordano a pitcher/outfielder (Croton HS) was voted Mid-Hudson Conference MVP. 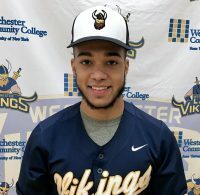 Brian Corporan INF (Bronx) and Felix Camacho C/1B Bronx made first Team All Mid-Hudson Conference. Steve Guzman INF (Bronx) made second team. Congratulations to Ryan Palace (Walter Panas HS), Luis Martinez (Bronx, NY), Brian Crawford (Carmel HS) and Olivia Jones (Briarcliff HS) who were named NCBCA/USBC COLLEGIATE Academic All Americans.